Sidney junior forward Ratez Roberts drives to the basket with pressure from Troy’s Eli Palmer during a GWOC game last December. Sidney is leaving the GWOC for the MVL in 2019. Though the Yellow Jackets will be paired in the same division as Xenia, Fairborn, West Carrollton and Stebbins, they’ll still play traditional opponents like Piqua and Troy the same amount of times in each sport as they currently do. Sidney and nine other schools are leaving the Greater Western Ohio Conference to reform the Miami Valley League, which will begin play in 2019. The MVL’s name was approved by the 10 schools’ superintendents on Wednesday. SIDNEY — The Miami Valley League is coming back, and though the divisional alignments may raise some Yellow Jacket fans’ eyebrows at first, Sidney athletic director Mitch Hoying said not much will be different from current schedules. Sidney, along with nine other schools, decided last February to leave the Greater Western Ohio Conference and form a new league. The new league name was approved on Wednesday by a unanimous vote of the 10 school districts’ superintendents — and what’s old is new again. The new conference will be a revival of the Miami Valley League, which Sidney helped form in 1926. Original charter members Piqua, Troy, Greenville and Xenia will also be in the MVL, along with Vandalia-Butler, Fairborn, Stebbins, Tippecanoe and West Carrollton. The schools will begin MVL play in the fall of 2019. The 10 schools are currently in the GWOC American League and will play in the conference in the 2018-19 school year. The MVL will be split into two divisions. Sidney will be in the Valley Division with Fairborn, Stebbins, West Carrollton, and Xenia. The Miami Division will be made of Piqua, Greenville, Troy, Tippecanoe and Butler. Hoying said schools in both leagues will play each other twice in most sports — meaning Sidney’ schedules won’t look too different despite being in the same division as the league’s southern schools. Sidney is currently in the GWOC American North Division with Piqua, Greenville, Troy, Tipp and Butler. “A six and four split among the teams is a silly way to do things and didn’t make a ton of sense when we were in the GWOC,” Hoying said. “It wouldn’t make sense in the MVL. The idea that there’ll be more travel really isn’t accurate. In most of the schedules, we’re going to end up playing each other the same amount, either once or twice. For football, Hoying said league schedules will feature nine conference games, like to the Western Buckeye League. Hoying said splitting the league into two divisions is best for competitive balance and creating excitement. 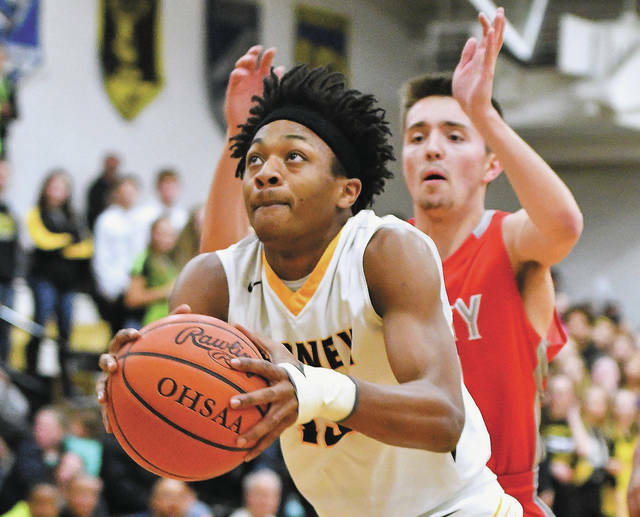 He pointed to last season’s GWOC American North Division boys basketball title race, which came down to a late-season contest between Sidney and Butler (which Sidney won). If all 11 American League teams played for one title, eventual Div. II state runner-up Trotwood-Madison would have won the basketball title running away. The Rams beat every American League team by at least 17 points. “The two five-teams divisions was something people were interested in from day one,” Hoying said. “Personally, I really like the divisions. I can point to that great night at Butler as a reason (for divisions). That meant a lot. If we don’t have divisions, that game doesn’t mean as much, because Trotwood already has won the league. It gives the opportunity for more games to have meaning late in the season. Hoying said early meetings among the new schools have gone well, and he likes how Sidney fits with the other schools. Enrollment disparity among the 20-team GWOC and the forced divisional crossover games were the two main reasons the departing teams decided to leave according to Hoying. The GWOC is split into a nine-team National League and 11-team American League. The American League is split into a six-team North Division and five-team South Division, while the National League is split into a four-team West Division and five-team East Division. The 10 departing schools have similar enrollments except Greenville and Tippecanoe, which are a bit smaller. All teams compete in Division II or III in football and Division I or II in boys and girls basketball. According to 2015 Ohio High School Athletic Association enrollment calculations (which measure only the enrolled underclassmen every two years), eight of the American League teams have boys enrollments between 354 and 513 and girls enrollments between 356 and 528. Greenville and Tipp have boys enrollments of 316 and 296, respectively, and girls enrollments of 319 and 294. Both schools are the only among departing American League teams that compete in Division II in basketball, baseball, and softball; the other eight play in Division I. National League teams are significantly larger, with no boys enrollment smaller than 627 and no girls enrollment smaller than 612. Centerville has the largest enrollments with 1,024 boys and 1,006 girls. Other schools in the National League are Beavercreek, Kettering Fairmont, Miamisburg, Northmont, Springboro, Springfield and Wayne. “The big problem that had plagued the league since its inception was how many, if any, games between American League and National League teams was appropriate,” Hoying said. “… Sidney’s stance was we didn’t want any. We felt it was in our best interest when we have teams that were good, we could reach out to those other larger schools and we could get a (nonconference) game set up. Sidney was a charter member of the GWOC, which was formed in 2001 when the Greater Miami Valley Conference merged with the Western Ohio League. The GWOC was originally made of 14 teams, with seven each from the GMVC and WOL. The conference grew to 17 schools in 2006 after several additions from the defunct Mid-Miami League, then grew to 18 in 2010 after the addition of West Carrollton. Tippecanoe and Stebbins joined the league in 2016 from the Central Buckeye Conference. Trotwood is one of the charter members of the GWOC and is the only American League team that won’t be joining the MVL. Hoying said Trotwood not being invited to leave with the other 10 American League teams was a competitive balance issue, in addition to wanting to limit the new league to 10 schools. “In terms of enrollment and geography they fit, but they don’t fit when it comes to competitive balance,” Hoying said in February. “In football and boys basketball, Trotwood is incredible. Their record against the 10 schools that are leaving (since the GWOC was formed) is incredible. In basketball it’s something like 143-6, in football they’re like 64-6. Hoying said he’s confident the conference splitting will be good for all schools. This entry was tagged athletic conference, athletic conferences, basketball, Butler, conference, Fairborn, Football, Greater Western Ohio Conference, greenville, GWOC, high school, Miami Division, Miami Valley League, Mitch Hoying, MVL, ohio, Piqua, schedule, scheduling, Sidney, Stebbins, Tippecanoe, Trotwood, Troy, Valley Division, Vandalia-Butler, West Carrollton, Xenia. Bookmark the permalink.